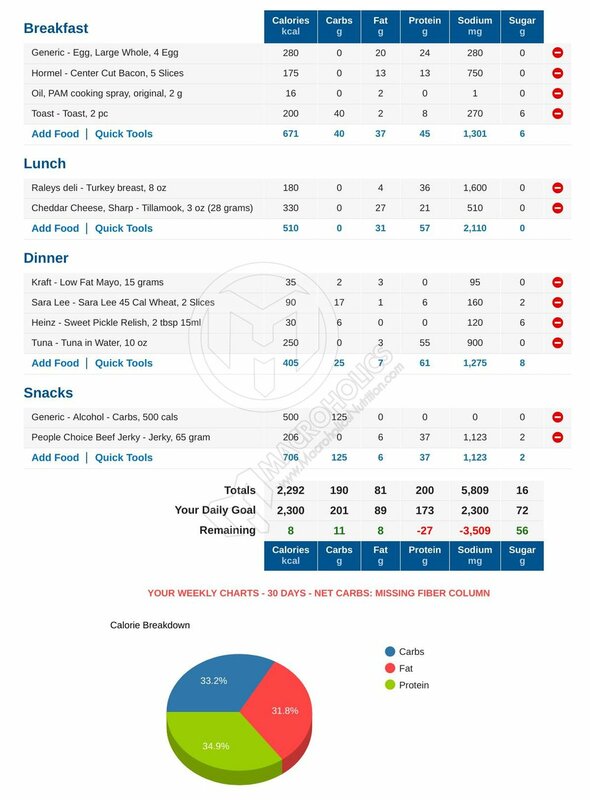 Macroholics offers sample meal plans for every caloric target. You'll get access to the 10 plans described below that are designed to help you navigate any situation successfully. On top of that, we offer a 100% customized sample meal plan that fits your targets based on your unique goals, food preferences, and lifestyle. Lunch: Usually Mexican food with coworkers. Usually enchiladas or fajitas. Dinner: Spaghetti with the family. Foods I don't like: Onions and fish. We will take that rough breakdown and create a custom sample meal plan for you incorporating as many of those foods as possible, or give you a great alternative that fits your targets and gets you great results. This resource has it's own section on our website. Check it out HERE. Weight isn't everything but it's a major goal for many, if not most of our clients. If you're looking to reach a target weight by a given date, this can help! Send us the below information VIA Text (806)392-6286 or email (MacroholicsNutrition@Gmail.com) and we will set up your custom target weight by date spreadsheet to help keep you headed in the right direction, at the right pace! 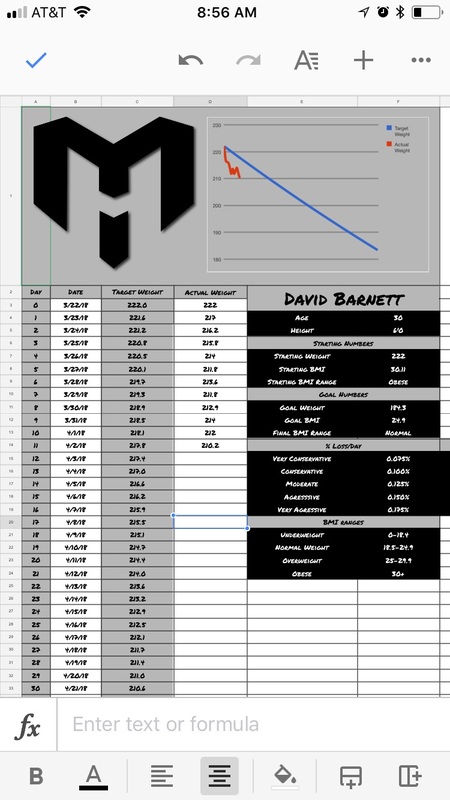 This is different for everyone but our general recommendation is a target weight that puts you at the upper limits of a normal BMI range (24.9) for clients with a significant amount of weight to lose. If you have a date in mind, just send that! For those who aren't sure, keep reading and choose one of the 5 paces below! The target weight loss for fat loss clients on the Macroholics program, the basis of your starting caloric prescription, and the weekly adjustments we give you is to target 0.5%-1% of total body weight loss/week. We recommend a very conservative, conservative, or moderate target pace for our clients. We have target weights or maintenance ranges for all of you. That said, we also offer guidance in a more thorough and effective goal setting experience. This board will have goals displayed publicly so you can be motivated and inspired by others as well as be your own source of motivation and inspiration! 2.) What is your goal? "I want to be leaner." "50 straight A+ days by planning and logging my full day of eating ahead of time every evening." 3.) Is your goal specific? Your goal should be clear, specific, and measurable. Otherwise, you won't be able to focus your efforts effectively. Imagine at your last doctor's appointment you were told that your blood pressure was very high and you don't want to die of a heart attack. A specific goal could be, "Get a blood pressure reading below 120/80." as opposed to, "I want to be healthier." 4.) What is the meaning or "why" behind your goal? You need to have a detailed "why" behind your goal. A clear meaning helps you follow through by reminding you why it's worth doing when you don't feel like doing it! Imagine you can't play with your grandkids more than a couple of hours because your back hurts and you're 50 pounds overweight. A good "meaning" would be "I want to be able to play with my grandkids all day without pain!" as opposed to, "I want to feel better." 5.) Is your goal achievable? Is this something that you can control? Do you have access to the time and resources necessary to achieve this goal? consistently and run my fastest 5K time ever." as opposed to, "I want to win my next 5K." which is highly dependent on the times of other runners in the race. Something you can't control. 6.) Is your goal relevant? Is this goal in line with your priorities? Can this goal be broken up into smaller pieces that need to be achieved one at a time? Imagine you're a new CrossFitter that wants to qualify for Regionals but you're a full time student and a single mother who can only train for an hour 3 days a week. If your studies and being a mom are your priorities, a goal like, "get my first unassisted pull-up" would be more relevant. 7.) What is the timeline of your goal? Every goal needs a target date, so that you have a deadline to focus on and something to work toward. This part of the SMART goal criteria helps to prevent everyday tasks from taking priority over your longer-term goals. Ask yourself what pace is appropriate and what you can achieve in a given timeline. I will review your goal, provide my suggestions/input for edits, and then add it to the board when we have finalized it! I will revisit these regularly and celebrate the accomplishments of the participants. Let me know if you have any questions or concerns. As a Macroholic, you'll have access to our nightly live Q&A sessions where David will be available to answer all of your questions about anything and everything. Ask your question(s) live, or, click the button below to submit a question that will be covered in our next Nightly Live Q&A session! For our clients who are hitting their targets but not seeing progress, we offer unlimited "Accuracy Reviews." These are designed to help Macroholics clients learn and refine how to track their food correctly and accurately. There are countless potential pitfalls that cause some people to underestimate their logging. We are trying to help those who think they are doing everything right, but maybe are missing some things on accident. As of 3/26/18: 96.15% (250 out of 260) of our clients who do an accuracy review either see progress or identify the reason they haven't been seeing progress! 1: Get your weight, first thing in the morning before you do anything else. 2: Throughout the day, take a picture of every single thing you eat or drink and make sure you log all of it in MyFitnessPal. 4: Get your weight again, first thing the next morning before you do anything else. 1: All of your food/drink pictures. 2: Screenshots of your full food journal. 3: Your macro and caloric screenshots. 4: Your body weight from first thing in the morning before this documented day. 5: Your body weight from first thing in the morning after this documented day. We will go through it together and we will identify anything you might be missing! *These images below are clickable links to our members only Facebook page accessible only to those with an active Macroholics membership. #5 "What should my goal weight be?" The images/videos below and descriptions provided are meant to serve as streamlined and simplified tools you can save on your smart phone and refer to when needed. We recommend saving these photos in your "notes" app or something similar to avoid accidentally deleting them or not having access when you don't have service. This 10 step instructional video explains how to create a recipe and log your homemade meals with perfect accuracy! This venn diagram is intended for clients that are newer to the program and working to develop a general awareness of how certain food choices will cause your percentages to shift. Knowing what you can/can't fit into your targets, in any given situation, makes it so much easier to get great results! Weigh your food in grams when you can. Measure your food when you can't measure it. Estimate your serving size using the serving size resource below and use the 1.25 estimation method broken down in our FAQ when you can't weigh or measure. Every food on this list has a minimum of 50% calories from protein. I've broken the choices up into different categories that you can refer to based on your specific needs. For example, if you're well over on carbs and low on protein, you can use the "pure protein" list or the "protein & some fat" list. Hitting your minimum protein target is, for most, the hardest daily target on the Macroholics program. Every food here will have a significant impact on your percentages assuming that your food choice accounts for a significant portion of your daily calories. This is a great tool for reference when you don't have access to a scale. Don't forget to incorporate the 1.25 estimation method broken down HERE when using this infographic. Don’t log alcohol as just calories. Follow these steps when you log it! Drinking responsibly and results are not mutually exclusive. But taking into account the hormonal impact that the 4th macronutrient, alcohol, has on our body is important. Ignoring this aspect gives us the illusion that we are in a good hormonal state for fat loss when we really aren’t. This resource is designed for you to take with you to the grocery store as a very rough idea of what to get. These are "staple" items for many, but not all of our clients. Use these 40 foods as a rough inspiration. You are by no means expected or required to incorporate these foods. All of the wording on the list below are clickable links from all over the internet. If you're logging something you can't measure accurately according to these steps, use the 1.25 estimation method described in our FAQ found HERE. Please keep in mind that this is inferior to the customizable sample meal plans we provide for free as part of your Macroholics membership. I can infinitely tweak anything in a one-on-one conversation to perfectly fit your unique targets, schedule, food preferences, and lifestyle. This resource has some weaknesses that can often generate some really odd meals/combinations. You can click on each scale for a thorough review and compare different features such as dimensions, max weight, weighable surface area, etc. Similar to the resource above and from the same source, this is the best breakdown of popular options available. Being low on an essential nutrient (potassium for example) is common in a caloric deficit. 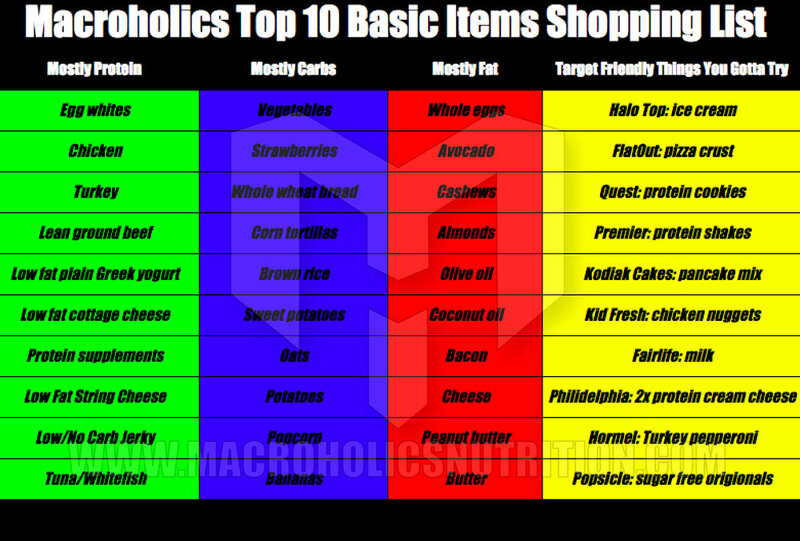 This list can help you adddress that while minimizing the impact on your carbohydrate/caloric targets. This calculator is designed so that you can follow the Macroholics program even when you don't have internet service! Follow the steps to get set-up and be ready to use this while traveling/camping/hunting/hiking/or on a cruise in remote areas where you will be without internet service for an extended period of time! 2: A Google Account (Not necessarily a Google email.) You can set that up HERE. 4: A scale to weigh your food in grams. 1: Open the spreadsheet in your Google Sheets app via the link on our Member's Only Community Page on the smartphone that you'll have with you on your trip by clicking the below button. 2: Once open in your Google Sheets app, select the three dots in the top right corner of the screen. "···" > "Share & export" > "Make a copy"
3: Once the copy is open, set the sheet to "Available offline". You can follow instructions on how to do that HERE. Note: If you experience an error message in making your copy available offline, try to make it available offline by using the Google Drive app. 4: There are 8 tabs at the bottom of the screen. The first tab named "nutrition info" is a collection of 6000+ basic foods as well as the calculator that you can use to calculate the total calories and total grams of carbs, protein, and fat in many common foods. 5: Weigh your food in grams and use the "my serving size" column to calculate the calories and macronutrients for a given item/serving size. Note: All numbers, including serving sizes, are based in grams. 6: Once you have your numbers, select the tab that corresponds to the day of the week you're currently tracking. 7: Your calorie, fat, carb, and protein totals will automatically update at the bottom.